This time, the Space Shuttle [Shuttle] Endeavor on mission STS-123 [STS123] launches for the International Space Station ISS [ISS] from NASA's [NASA] southern pad 39A at the Kennedy Space Center [KSC], Florida, USA. This mission was lifting a special Japanese module [JIBO] to the International Space Station (ISS). 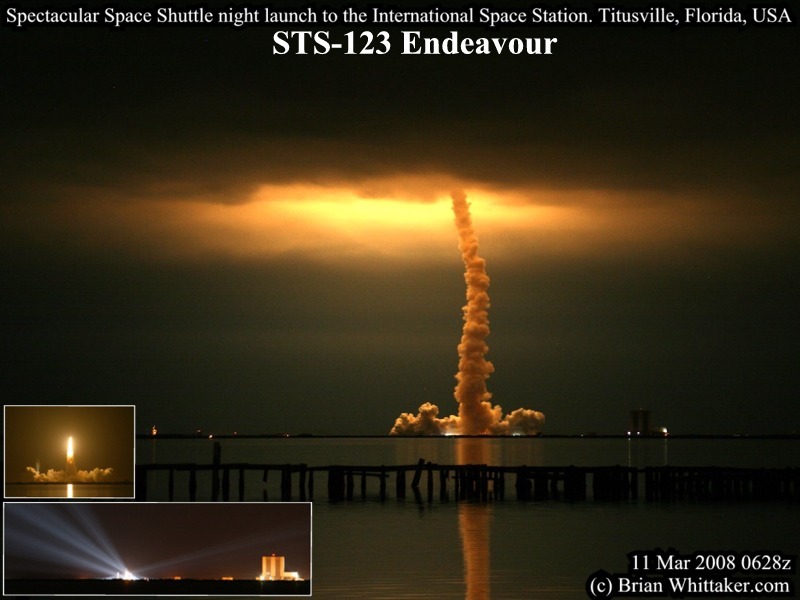 Visible in the inset are search lights on the Shuttle and the launch itself. 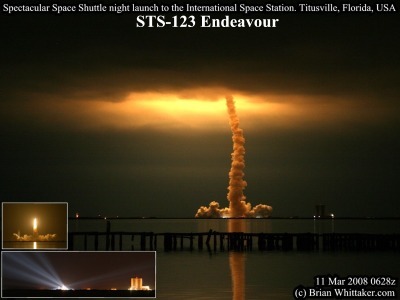 The featured image shows the unusual lighting as the shuttle entered the overcast cloud. Observers had just witnessed the darkness of night become almost day from the shuttle's exhaust, but the crowd all gasped by this eerie sight as it entered and illuminated the cloud. It went rather dark again shortly after this image was taken as the cloud was just too thick to allow the exhaust to have any affect. Interestingly, from this vantage point at Kennedy Point Park south Titusville (19.7km), the sound of the launch took over a minute to be heard, well after the rocket had long since disappeared into the cloud! It was also considerably less loud (and perhaps disappointing) from here, then it was from my earlier launch observation from 10.7 km. Obviously the VIP/press site at 5 km must be really exciting! I personally recommend trying to watch one even though there are currently only ten more ever scheduled [Next Launch Schedule]. You can often see the Shuttle or ISS overhead from your home [Heavens-Above predictions].